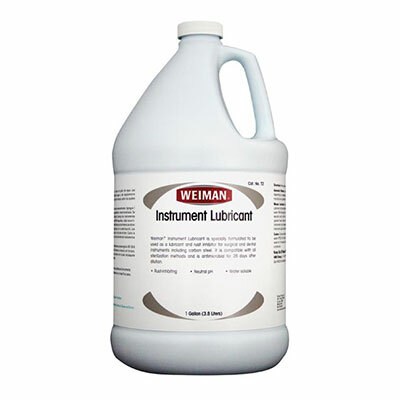 Weiman Instrument Lubricant T2 is a unique rust inhibitor and lubricant for surgical instruments. This lubricant contains corrosion inhibitors that protect all types of metal instruments, including carbon steel. No rinsing or wiping of instruments is necessary. After manual use, allow instruments to dry thoroughly and then proceed to sterilization. Instrument Lubricant does not interfere with sterilization and maintains free working instruments. Weiman provides comprehensive contract packaging solutions – product development, packaging design, state-of-the-art manufacturing, regulatory consulting and logistics planning – so that all your private label product needs are satisfied by a single, full-service supplier. Weiman is a registered manufacturer for EPA regulated products and FDA Medical Devices. Our manufacturing and business processes have earned ISO 9001 and ISO 13485 certifications to assure the highest quality products and services.